The reduction or discontinuation of psychiatric medications such as antidepressants, antipsychotics or anxiolytics can cause physical and psychological withdrawal and rebound symptoms. Withdrawal symptoms may be so severe that patients are unable to continue reducing the dose, regardless of the medication’s efficacy. On top of this, withdrawal symptoms and relapse can be wrongly attributed to the original disorder, patients may continue to take medications unnecessarily, medication side effects persist, and emotional distress can worsen. Withdrawal symptoms can be minimized and even prevented by “tapered”, or gradual, reduction. Such tapering means that the patient need not stop taking their medication abruptly or according to an arbitrarily fixed schedule, but instead in small and flexible steps over an extended period of time. Because many difficulties result from reduction taking place too rapidly, if the dose is instead reduced gradually, day by day, withdrawal symptoms can be mitigated, sometimes dramatically. physicians who see some of their patients withdraw successfully erroneously expect all patients to be able to do so. Patients have pursued gradual tapering on their own initiative, using available medication and makeshift solutions such as buying pill cutters and scales, counting capsule granules, making use of compounding pharmacies, and switching to liquid forms and measuring cups. While these existing methods do allow for gradual tapering in principle, in practice they present too great a difficulty for patients and greatly limit the number of patients who could benefit from tapered reduction. Tapering strips not only make it easier for the physician to explain how the dose reduction process works, they also make it easier for patients to understand the process. They offer real and concrete choices to the patient, making shared decision a logical and integral part of treatment and giving patients more responsibility for their own treatment. In a tapering strip, medication is packaged in a roll or strip of small daily pouches. Each pouch is numbered and has the same or slightly lower dose than the package before it. Strips come in series covering 28 days and patients can use one or more strips to regulate the tempo of their dose reduction over time. 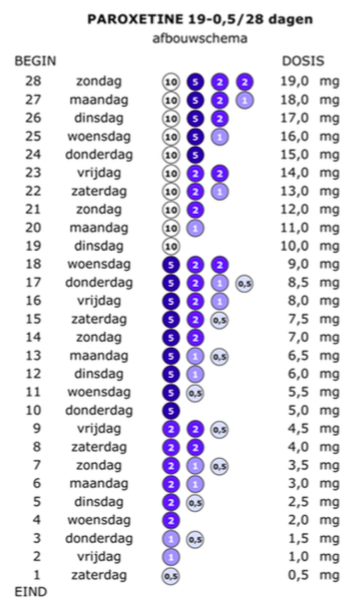 Dose and day information printed on each pouch allow patients to precisely record and monitor the progress of their reduction.